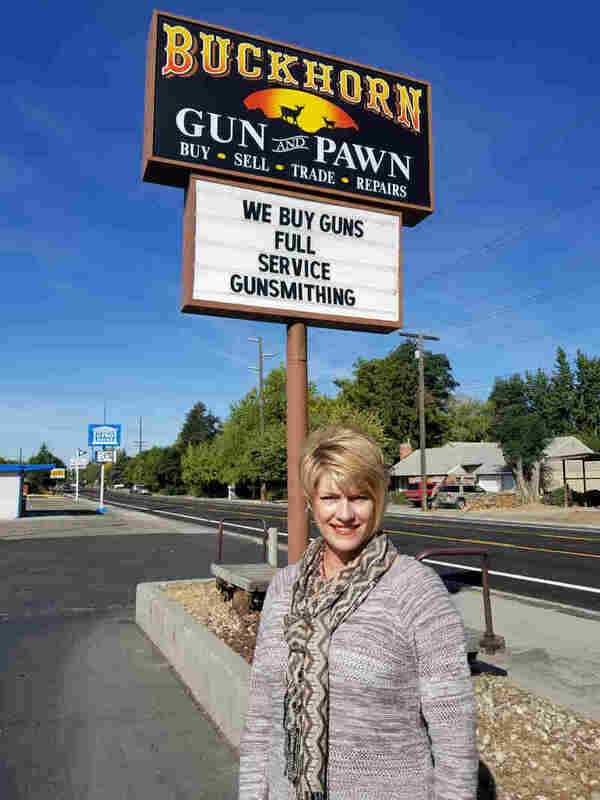 State Rep. Christy Perry, who co-owns a gun store in Boise, Idaho, is helping lead a campaign to persuade voters to approve Medicaid expansion in the state. State Rep. Christy Perry pledged her full support for President Trump while standing next to her SUV, which has “NRA” on the license plate and is parked outside a Boise, Idaho, gun shop she co-owns. “He’s doing a good job,” said Perry, a four-term Republican member of the Idaho Legislature who has voted for a litany of conservative causes, including weakening labor unions, restricting abortion and boosting charter schools. With those credentials, Perry hopes for another big win on Election Day — one that puts her at odds with Trump and GOP orthodoxy. She’s helping lead the drive to persuade state voters to expand Medicaid — a central tenet of the Affordable Care Act, the 2010 law embraced by Democrats and derided by many Republicans. Perry has been pushing for Medicaid expansion the past several years in the state legislature, but the efforts were thwarted by top leaders in the state House. Now there’s a ballot initiative called Proposition 2 that puts the matter before Idaho voters. Perry said Medicaid coverage is desperately needed by people struggling in low-wage jobs, and the economics make sense for the state given the federal government will pay 90 percent of the cost. An expansion would reduce or eliminate the need for other Idaho-funded programs to help the uninsured, she said, and the added coverage would help more people get back to work. “Employers need every able body,” she said. She said the state can’t wait any longer. If successful on Nov. 6, about 62,000 Idaho adults would be added to the state-federal health insurance program that covers 73 million low-income Americans. It would be a major advance for Obamacare into one of the most conservative parts of the country. Idaho is one of 17 states where GOP lawmakers are in control of legislatures that have steadfastly resisted expanding Medicaid. But voters in Idaho, Nebraska and Utah will decide next month whether to buck their political leaders and go forward with the expansion. The issue is also on the ballot in Montana, which expanded Medicaid in 2016. There, residents will decide whether to continue it past 2019. Of those states, Idaho is arguably the least politically hospitable for Medicaid expansion. Trump carried Idaho by the largest margin — nearly 32 percentage points in 2016. Last year, Maine became the first state to approve expanding Medicaid via a ballot referendum, although the GOP governor has stalled implementation. Unlike Maine, where political power has been split between Democrats and Republicans in recent years, Idaho, Utah and Nebraska are solidly GOP territory. Trump and Republican congressional leaders have vowed to repeal the health law, which makes the expansion possible by providing the bulk of the funding for those who qualify for new coverage. Perry, 50, doesn’t see a problem getting Trump voters to back the expansion. She said that the Republican failure to repeal the law last year opened the door for conservative states to go forward. “I think people here listen to that and it now falls to states to go ahead” with expansion, she said. 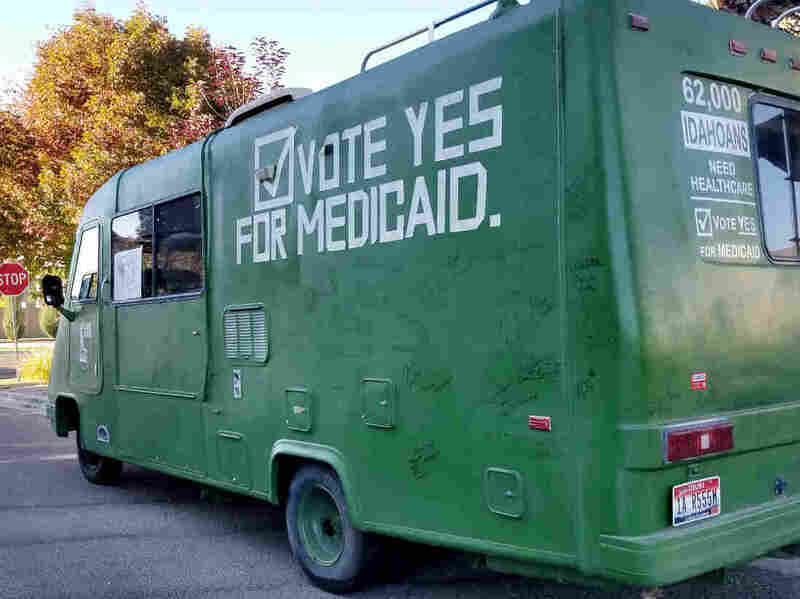 Organizers with Idahoans for Healthcare have been driving this green vehicle around the state to campaign for Medicaid expansion. Supporters of the referendum were successful in garnering 70,000 signatures to put the vote on the ballot, but they face a steep challenge educating the electorate about the complexities of Medicaid financing. Tim Dunnagan, dean of the College of Health Sciences at Boise State University, said few Idaho voters know that most states — including neighboring Oregon and Washington — have already expanded Medicaid. Because the issue can be confusing, he said, voters may gravitate to their long-held concerns about paying more taxes and government overreach. Perry and the broad coalition endorsing the referendum — including teachers, employers, county sheriffs and the health industry — seek to remind voters that they are already paying for the health law’s provisions through their federal taxes and the expansion would bring $400 million in federal funds into the state. The expansion would cover residents with incomes below 138 percent of the federal poverty level, or nearly $17,000 a year for an individual. Currently, Idaho adults who do not have children and are not disabled are not eligible for Medicaid. Those with children can only qualify with incomes up to 26 percent of the poverty level, or $3,156 a year. The expansion also would eliminate a gap for residents whose income is too low to qualify for government subsidies to buy private coverage but earn too much to qualify for Medicaid. On a recent evening, about 20 volunteers in favor expansion gathered about 10 miles east of downtown Boise, where a field organizer gave them voter lists and instructions on how to approach homeowners. Tracy Olson, 54, a nurse turned real estate agent, and Jill Galanter, 55, a physical therapist, went to an upper-income, planned community. About two-thirds of the people they met said they support expansion and most of the rest had not heard about it. Only a couple of people said they oppose the ballot question. In their one-minute pitch, Olson and Galanter explained the coverage gap for low-income residents and the millions in federal dollars the state can gain by expanding. They didn’t mention the ACA. That’s not an oversight, organizers said. “Obamacare has a negative connotation here,” Perry said. Mike Brown, 50, an engineer, told Olson he didn’t know the issue but added that his health costs have soared in recent years. He nodded as Olson explained whom the expansion would help. Richard Rapp, 75, a retired head of the career center at Boise State University, said he will support the expansion out of humanitarian reasons. “Too many people don’t have adequate coverage, and that ends up costing us all,” he said. Later that week, another volunteer, Lauren Necochea, also found support in the Nampa area, west of Boise. Asked if he knew that the Medicaid expansion is part of the ACA, Holm shook his head. “If they can’t do away with it, maybe this is a way to make it better,” he said, adding that he believes the health law has good and bad parts. The Idaho Republican Party and the conservative Idaho Freedom Foundation are fighting the ballot initiative. Foundation officials say it would divert money that could be spent on roads and education. “Medicaid expansion is a cornerstone of Obamacare, which has failed to cover everyone and has led to increasing health costs,” said Fred Birnbaum, vice president of the foundation. His group plans to run radio commercials, use social media and circulate flyers. Lawmakers opposed to expanding Medicaid have argued the state could not afford its share of the cost without raising taxes. Under the law, the federal government pays about 90 percent of the costs for expansion and states cover the rest. But a state-funded report this year found it would cost Idaho relatively little — $105 million over 10 years, which includes savings from state and county funds that would no longer be needed to help the uninsured. Idaho’s annual budget tops $3 billion per year. Brad Little, the GOP nominee for governor who is widely expected to win in November, said he would abide by the will of the voters. Perry is not the only Republican state lawmaker who has come out in support of expansion, but she is one of the most prominent. Perry tried — and failed — to get lawmakers to expand Medicaid. She is not running for re-election. “Christy [Perry] is well-known among GOP women and well-liked,” said Toni Lawson, vice president of government relations at the Idaho Hospital Association, which supports the initiative. She said persuading GOP women to vote for expansion will be key to a victory.